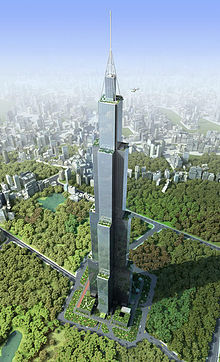 A Chinese firm best known for building air conditioning units is constructing a vertical city. Broad Sustainable Construction (BSB) said this week that next month it will finally break ground on its the tower that will not only be the world’s tallest but could, according to BSB, become a model for how China deals with mass urbanization. The 838-meter-tall (2,749 feet) tower more commonly known as “Sky City” will be about 10 meters (32.8 ft) taller than the world’s highest skyscraper at present, Dubai’s Burj Khalifa. Moreover, it will be stationed in the southern, idyllic provincial capital of Changsha of about 7 million people—tiny compared to cities like Beijing or Shanghai. The site for Sky City in Changsha, China. But whether BSB will actually pull off the project is up for some debate. Chairman Zhang Yue made waves in 2011 when the company built a 15-story building in 30 days, using prefabricated steel and concrete building material. Yue has planned to use a similar approach with Sky City and bragged the company would complete construction within 90 days. The company has had to delay its plans once already, reportedly because local authorities held back permits because of concerns about safety, environmental impact, and congestion. On its website, BSB now says construction will take seven months. A visualization of “Sky City”. Broad Group Sky City is slated to have 17 helipads, gardens, and courtyards for sports. Broad Group BSB says the building will be able to withstand an earthquake of magnitude 9. Broad Group Aerial visualization of Sky City. Broad Group BSB also says the building will eliminate 99% of PM 2.5, particulate matter in the air that is a marker of pollution. Broad Group A visualization of Sky City at night.